In this tutorial i am going to discuss about How to Send e-mail using NodeJS. Sending an email in nodejs is a breeze thanks to NodeMailer. Let me walk you through the process of sending an email using NodeMailer. 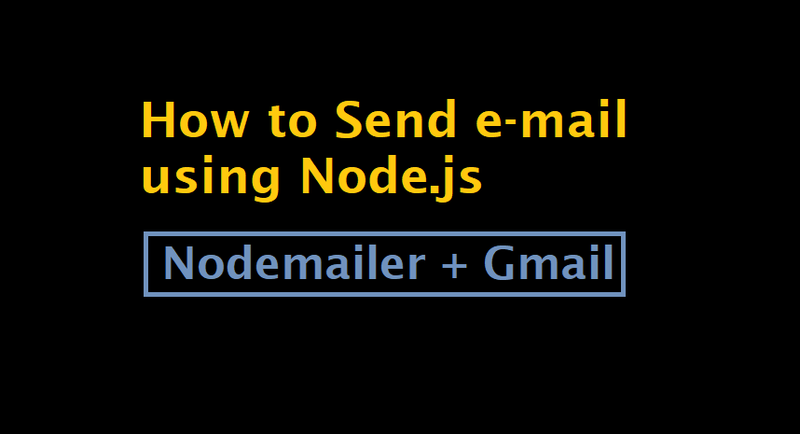 In this tutorial i am going to discuss about sending e-mail with Node.js. We will use Nodemailer and Gmail account so create a gmail account for this tutorial..
firstly install nodemailer in your node application. Nodemailer needs a transport service using which it can send emails. So we use gmail. The next up is our auth object in which we have to specify our email address and password of Gmail for allowing Nodemailer to login and send email using our gmail account. Now we need a second configuration object where we will be configuring our email details. Before sending your email using gmail you have to allow non secure apps to access gmail you can do this by going to your gmail settings here. Once less secure apps is enabled now nodemailer can use your gmail for sending the emails. Now the last bit is actually sending the email we can do that by using sendMail method provided by the transporter object we created above. sendMail takes two argument mailOptions and a callback function which will be called when the mail is sent. The callback function will be called when either email sent successfully our an error occurred. I hope you like this tutorial How to Send e-mail using NodeJS.